Download a pair of passes to see Patriots Day in Philadelphia! You can download an admit two pass to see the new movie Patriots Day at UA Riverview Plaza Stadium 17 & RPX - 1400 S. Columbus Blvd., Philadelphia, PA 19147, on Tuesday January 10th, 2017 at 7:00pm. 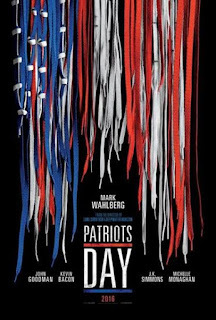 An account of the Boston Marathon bombing, PATRIOTS DAY is the powerful story of a community’s courage in the face of terror. In the aftermath of an unspeakable attack, Police Sergeant Tommy Saunders (Mark Wahlberg) joins courageous survivors, first responders and investigators in a race against the clock to hunt down the bombers before they strike again. Weaving together the stories of Special Agent Richard DesLauriers (Kevin Bacon), Police Commissioner Ed Davis (John Goodman), Sergeant Jeffrey Pugliese (J.K. Simmons) and nurse Carol Saunders (Michelle Monaghan) this visceral and unflinching chronicle captures the suspense of one of the most sophisticated manhunts in law enforcement history and celebrates the strength of the people of Boston. CLICK HERE to join our Mind on Movies Philadelphia Email List.